THE LOWDOWN This 17th century former monastery has terraced gardens that plunge over the cliff towards the sparkling Bay of Salerno, making the uninterrupted views some of the best on the Amalfi Coast. The hotel’s only restaurant, Il Refettorio, received its first Michelin star in 2017 for its bold Mediterranean gastronomic menu, incorporating fresh ingredients from the resort’s garden. THE CHEF Christoph Bob from Alain Ducasse’s thrice Michelin starred restaurant at the Plaza Athénée in Paris. WHAT TO ORDER The broad bean salad with bacon and smoked olive oil followed by the king prawn ravioli. BEST TABLE Sea-view tables on the terrace under the pergola are meraviglioso – overlooking the hotel’s stunning gardens and out across the Tyrrhenian Sea. If you’re there for sunset, everything is glazed in an apricot glow. HOW TO GET THERE Amalfi port is the closest marina, a 10-minute drive from the hotel. WHO GOES Prince Albert and Princess Charlene of Monaco, and Jake Gyllenhaal. THE LOWDOWN This 17th century former monastery has terraced gardens that plunge over the cliff towards the sparkling Bay of Salerno, making the uninterrupted views some of the best on the Amalfi Coast. The hotel’s only restaurant, Il Refettorio, received its first Michelin star in 2017 for its bold Mediterranean gastronomic menu, incorporating fresh ingredients from the resort’s garden. THE CHEF Christoph Bob from Alain Ducasse’s thrice Michelin starred restaurant at the Plaza Athénée in Paris. WHAT TO ORDER The broad bean salad with bacon and smoked olive oil followed by the king prawn ravioli. BEST TABLE Sea-view tables on the terrace under the pergola are meraviglioso – overlooking the hotel’s stunning gardens and out across the Tyrrhenian Sea. If you’re there for sunset, everything is glazed in an apricot glow. HOW TO GET THERE Amalfi port is the closest marina, a 10-minute drive from the hotel. WHO GOES Prince Albert and Princess Charlene of Monaco, and Jake Gyllenhaal. THE LOWDOWN The only three Michelin starred restaurant on the Côte d’Azur, it’s located at the LVMH-owned Résidence de la Pinède, which has just been redesigned by Jean-Michel Wilmotte. THE CHEF Resident chef Arnaud Donckele has had a hand in everything – even designing the unique pottery-inspired crockery. WHAT TO ORDER Try the scarlet prawns seared with a hint of grapefruit and the special zitone pasta starter that’s filled with black truffle and foie gras. BEST TABLE Whether inside or al fresco, nearly every seat is positioned to enjoy perfect views of the bay. HOW TO GET THERE Tender in to shore from a yacht moored in the bay – or it’s a five-minute car ride from the Port of Saint-Tropez. WHO GOES Saint-Tropezian visitors from old money to celebs angle for a table. John Legend and his wife Chrissy Teigen were spotted here. THE LOWDOWN The only three Michelin starred restaurant on the Côte d’Azur, it’s located at the LVMH-owned Résidence de la Pinède, which has just been redesigned by Jean-Michel Wilmotte. THE CHEF Resident chef Arnaud Donckele has had a hand in everything – even designing the unique pottery-inspired crockery. WHAT TO ORDER Try the scarlet prawns seared with a hint of grapefruit and the special zitone pasta starter that’s filled with black truffle and foie gras. 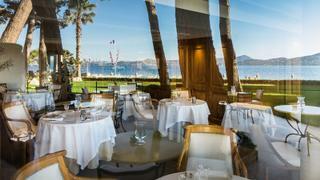 BEST TABLE Whether inside or al fresco, nearly every seat is positioned to enjoy perfect views of the bay. HOW TO GET THERE Tender in to shore from a yacht moored in the bay – or it’s a five-minute car ride from the Port of Saint-Tropez. WHO GOES Saint-Tropezian visitors from old money to celebs angle for a table. John Legend and his wife Chrissy Teigen were spotted here. THE LOWDOWN 7 Pines Ibiza is the newest resort to open this year and is set to be a foodie’s dream. 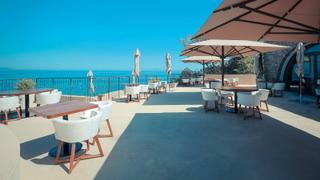 The hotel’s cliffside restaurant, The View, offers European dishes with a Korean twist. THE CHEF Executive chef Bijendra Yadav, formerly of St Regis Dubai, is overseeing, with Korean native Seungmin Bae as head chef. WHAT TO ORDER Kagoshima beef fillet with black garlic purée, charred leek and Bordelaise sauce. BEST TABLE For a taste of the culinary action, the chef’s table is set around the open kitchen. HOW TO GET THERE The nearest marina is Sant Antoni de Portmany and the resort also has its own buoy you can tie up to. WHO GOES Our bet? Hot young things looking for fine dining with a serious slice of chill. THE LOWDOWN 7 Pines Ibiza is the newest resort to open this year and is set to be a foodie’s dream. 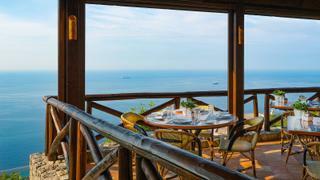 The hotel’s cliffside restaurant, The View, offers European dishes with a Korean twist. THE CHEF Executive chef Bijendra Yadav, formerly of St Regis Dubai, is overseeing, with Korean native Seungmin Bae as head chef. WHAT TO ORDER Kagoshima beef fillet with black garlic purée, charred leek and Bordelaise sauce. BEST TABLE For a taste of the culinary action, the chef’s table is set around the open kitchen. HOW TO GET THERE The nearest marina is Sant Antoni de Portmany and the resort also has its own buoy you can tie up to. WHO GOES Our bet? Hot young things looking for fine dining with a serious slice of chill. THE LOWDOWN Coya’s first venture on the Mediterranean coast opened its doors during this year’s F1 Grand Prix, above Jimmy’z and the Monte-Carlo Bay Hotel. This restaurant is brimming with Peruvian trinkets and dark hand-crafted furniture – but it’s the panoramic terrace that has star appeal. THE CHEF Executive chef Sanjay Dwivedi has taken up the stove, having overseen the kitchens across Coya London, Miami and Dubai – he’s a dab hand at combining traditional Peruvian cuisine with modern season ingredients. WHAT TO ORDER Dorada a la parrilla – chargrilled whole sea bream with peas, asparagus and broad beans. BEST TABLE Table 72; it’s right in the middle of the action for people-watching, and near the kitchen for the smells. HOW TO GET THERE Guests can tender in to the Monte-Carlo Bay Hotel, a stone’s throw away from the restaurant. WHO GOES Tommy Hilfiger and Kris Jenner were at the opening night. 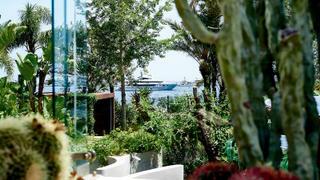 THE LOWDOWN Coya’s first venture on the Mediterranean coast opened its doors during this year’s F1 Grand Prix, above Jimmy’z and the Monte-Carlo Bay Hotel. This restaurant is brimming with Peruvian trinkets and dark hand-crafted furniture – but it’s the panoramic terrace that has star appeal. WHAT TO ORDER Dorada a la parrilla – chargrilled whole sea bream with peas, asparagus and broad beans. BEST TABLE Table 72; it’s right in the middle of the action for people-watching, and near the kitchen for the smells. HOW TO GET THERE Guests can tender in to the Monte-Carlo Bay Hotel, a stone’s throw away from the restaurant. THE LOWDOWN Owned by the Chaidemenos brothers (of Canaves Oia hotels), this hidden Cycladic-style taverna opened in May 2017 and is already proving to be a secret hotspot for those tired of squeezing into the restaurants at Amoudi Bay. 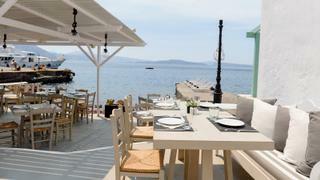 It’s all about unpretentious, open-air dining serving fuss-free Mediterranean and Greek dishes. THE CHEF Giorgos Sotiriadis is head chef, hailing from the mainland city of Thessaloniki, where he worked in a number of local fish restaurants, mastering the art of simple, pared-down cooking. WHAT TO ORDER Catch of the day, delivered by local fishermen. Cod tempura and tomato fritters is a favourite. BEST TABLE As the only restaurant in Armeni Bay, all tables are as close to the water as you can get. HOW TO GET THERE Guests can access the taverna by the steps from the main street in Oia. A complimentary boat taxi from Amoudi Bay is offered upon request. WHO GOES Loved-up couples wanting a romantic, lantern- lit dinner by the sea. Instagram sensation Chiara Ferragni was recently spotted. THE LOWDOWN Owned by the Chaidemenos brothers (of Canaves Oia hotels), this hidden Cycladic-style taverna opened in May 2017 and is already proving to be a secret hotspot for those tired of squeezing into the restaurants at Amoudi Bay. It’s all about unpretentious, open-air dining serving fuss-free Mediterranean and Greek dishes. THE CHEF Giorgos Sotiriadis is head chef, hailing from the mainland city of Thessaloniki, where he worked in a number of local fish restaurants, mastering the art of simple, pared-down cooking. WHAT TO ORDER Catch of the day, delivered by local fishermen. Cod tempura and tomato fritters is a favourite. BEST TABLE As the only restaurant in Armeni Bay, all tables are as close to the water as you can get. HOW TO GET THERE Guests can access the taverna by the steps from the main street in Oia. A complimentary boat taxi from Amoudi Bay is offered upon request. WHO GOES Loved-up couples wanting a romantic, lantern- lit dinner by the sea. Instagram sensation Chiara Ferragni was recently spotted. 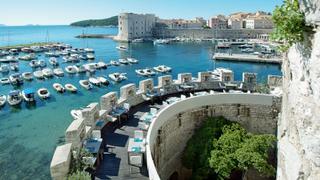 THE LOWDOWN This is the grande dame of Dubrovnik dining and the glitziest restaurant in the city. And no wonder there’s a palpable buzz about it – this March it was awarded a Michelin star. It is flavoursome, beautifully presented food in an unrivalled setting – perched on top of the historic city walls. THE CHEF Head chef Marijo Curic is one of only three chefs in Croatia to hold stars. He’s worked with Marcus Wareing in London and at Le Meurice in Paris. WHAT TO ORDER The five-course tasting menu with dishes such as scampi carpaccio, black pork with pork skin chips and chocolate mousse. BEST TABLE All tables are cleverly positioned so you can peer through the wall battlements over dinner. Because of its World Heritage Site location, getting a reservation is as hard as securing prime berth at the Monaco Grand Prix. HOW TO GET THERE Large boats can moor on the island of Lokrum, directly opposite the restaurant and take a tender across to the old town port. WHO GOES Beyoncé and Jay-Z, Gerard Butler, and the cast of Game of Thrones. THE LOWDOWN This is the grande dame of Dubrovnik dining and the glitziest restaurant in the city. And no wonder there’s a palpable buzz about it – this March it was awarded a Michelin star. It is flavoursome, beautifully presented food in an unrivalled setting – perched on top of the historic city walls. THE CHEF Head chef Marijo Curic is one of only three chefs in Croatia to hold stars. He’s worked with Marcus Wareing in London and at Le Meurice in Paris. WHAT TO ORDER The five-course tasting menu with dishes such as scampi carpaccio, black pork with pork skin chips and chocolate mousse. BEST TABLE All tables are cleverly positioned so you can peer through the wall battlements over dinner. Because of its World Heritage Site location, getting a reservation is as hard as securing prime berth at the Monaco Grand Prix. HOW TO GET THERE Large boats can moor on the island of Lokrum, directly opposite the restaurant and take a tender across to the old town port. WHO GOES Beyoncé and Jay-Z, Gerard Butler, and the cast of Game of Thrones. THE LOWDOWN Domaine Misíncu opened quietly last summer in Corsica’s remote Cap Corse, known for its aquamarine waters and rugged, hilly terrain, once the site of the famous Hôtel le Caribou. Tra di Noi is the hotel’s slick restaurant, and architect Olympe Zographos is behind the Corso-Greek interior. 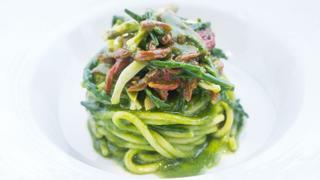 Come here for authentic sharing plates of Corsican food with a touch of French pomp. THE CHEF Clément Collet is head chef. He’s had spells under Hélène Darroze at the Connaught and is big on local produce – from honey (from the on-site apiary) to cheese (there’s a small dairy too) to the now-requisite organic vegetable garden. WHAT TO ORDER The octopus tentacle with langoustine fritters, puréed carrot and citron confit. BEST TABLE There’s no such thing as a lousy view here. All the tables on the terrace overlook the sea and you’ll adore dining under the glittering stars after sunset. HOW TO GET THERE For small boats, Santa Severa’s marina is a three- minute drive away from the hotel. For bigger boats, Macinaggio port is a 17-minute ride away. WHO GOES Stylish couples who like their restaurants smart, fashionable and too tempting not to photograph. THE LOWDOWN Domaine Misíncu opened quietly last summer in Corsica’s remote Cap Corse, known for its aquamarine waters and rugged, hilly terrain, once the site of the famous Hôtel le Caribou. Tra di Noi is the hotel’s slick restaurant, and architect Olympe Zographos is behind the Corso-Greek interior. Come here for authentic sharing plates of Corsican food with a touch of French pomp. THE CHEF Clément Collet is head chef. He’s had spells under Hélène Darroze at the Connaught and is big on local produce – from honey (from the on-site apiary) to cheese (there’s a small dairy too) to the now-requisite organic vegetable garden. WHAT TO ORDER The octopus tentacle with langoustine fritters, puréed carrot and citron confit. BEST TABLE There’s no such thing as a lousy view here. All the tables on the terrace overlook the sea and you’ll adore dining under the glittering stars after sunset. HOW TO GET THERE For small boats, Santa Severa’s marina is a three- minute drive away from the hotel. For bigger boats, Macinaggio port is a 17-minute ride away. WHO GOES Stylish couples who like their restaurants smart, fashionable and too tempting not to photograph.